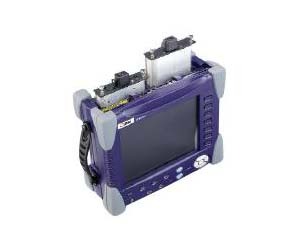 The JDSU OTDR plug-in module family offers a wide range of high-performance OTDRs for the network applications of today, such as FTTx, 40G and ROADM. As fiber installers and technicians continue to look for ways to reduce time and costs during field operation, it is essential for them to use the right tool for the job at hand. The combination of an unprecedented 0.1 s refreshing time, the shortest event resolution (0.8 m event dead zone and 4 m attenuation dead zone), and a 40 dB dynamic range, makes the MR OTDR Module an ideal tool for the qualification of any type of fiber network.